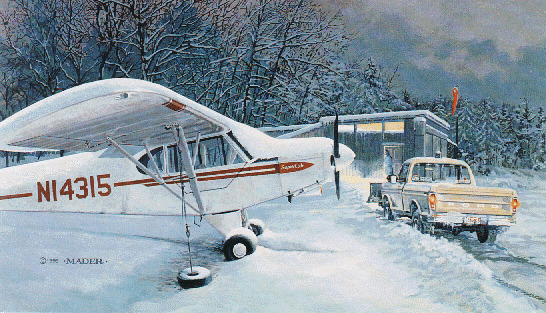 A Piper PA-18-150 Super Cub is tied down outside, covered in snow, with an idling pickup for company. It's a lousy day, cold and dark - and the guys are warm and dry in its hangar. A heck of a way to treat a Super Cub. Such has been the record of this versatile, short-field, load-lifting aircraft, that it has grown in desirability constantly, since its production started in 1949. The last Super Cub was built 44 years later, in 1993 - and demand has put the price for a used one today at a higher figure than Piper listed for new ones in 1983! Original: 30" x 24" acryilc on canvas. Reproduction image 19" x 14" on 24" x 20" archival stock. Edition: 1,000 signed and numbered prints.